GUNNISON, Colo. – Many of the greatest athletes in ProRodeo make their way to this picturesque community every July. 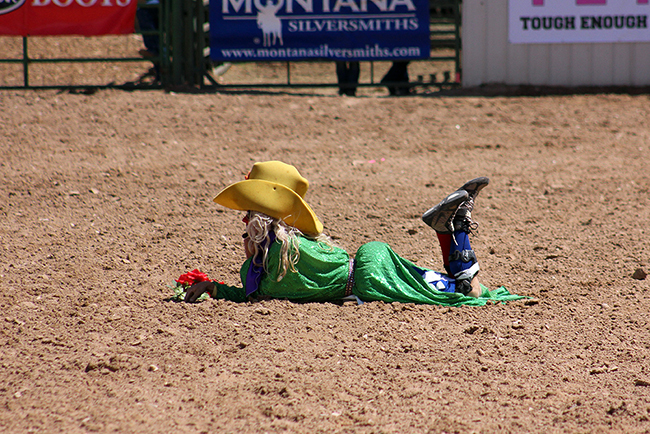 John Harrison is an entertainer, rodeo clown, barrelman and comedian all rolled up in a ball of fun and funny, and he might be the best athlete of them all at this year’s Cattlemen’s Days PRCA Rodeo, set for 7 p.m. Thursday, July 12, to Saturday, July 14, at Fred Field Western Center in Gunnison. Harrison is half-artist, half-entertainer, and he molds those pieces together quite well. On top of that, he utilizes his athleticism in some comedic ways to produce an award-winning showcase throughout each of the three performances. He is a four-time winner of the Professional Rodeo Cowboys Association Comedy Act of the Year and a three-time winner of the Coors Man in the Can award, an honor bestowed upon the top barrelman in ProRodeo based on peer votes. But those awards don’t define the third-generation cowboy. “I love my job, but the best part is the traveling and doing things with my family,” Harrison said. “There’s the stress of getting animals and everything ready for a performance, but the reward is great when the crowd comes out to enjoy the rodeo. Raised in Soper, Okla., to a rodeo family, Harrison began his entertainment career as a trick rider. He joined the PRCA in 1999, and within five years, he had transitioned to being a clown and barrelman. It provided greater opportunities and has allowed him the chance to showcase the funny side of his amazing abilities. It’s been pretty good. When possible, his wife, Carla, and their three children travel the rodeo circuit with him. They will be with him in Gunnison, and he’s excited to be part of the historic event. Colorado’s hidden gem is the longest continuous-running rodeo in the state. It also boasts of having the largest Tough Enough to Wear Pink campaign in the sport. “It is a traditional rodeo with a great feel to it, having the track that runs on the outside of the arena,” Harrison said. “That committee finds a cause, and they have delivered on their cause greater than any other committee in the nation. That says something to me. And that’s why he’s excited to return to Gunnison.